Fig. 103 I-S/L-M model. (b) The effect of a shift in the L-M schedule. Fig. 103 I-S/L-M model. (a) The general equilibrium position. a theoretical construct that integrates the real, I-S (investment-saving), and the monetary, L-M (demand for, and supply of, money), sides of the economy simultaneously to present a determinate general equilibrium position for the economy as a whole. 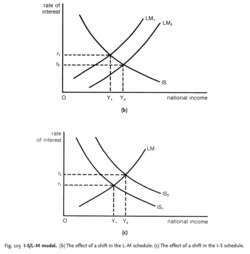 In the model, SAVING is a function of the level of NATIONAL INCOME, and INVESTMENT is a function of the INTEREST RATE and the MARGINAL EFFICIENCY OF CAPITAL/ INVESTMENT. The I-S SCHEDULE shows the combinations of levels of national income and rate of interest where the equilibrium condition for the real economy I = S holds (see EQUILIBRIUM LEVEL OF NATIONAL INCOME). The demand for money, L, is a function of the level of national income (TRANSACTIONS DEMAND) and the rate of interest (SPECULATIVE DEMAND). The MONEY SUPPLY, M, is given exogenously. The L-M SCHEDULE shows the combinations of levels of national income and rates of interest where the equilibrium condition for the monetary economy 1 = M holds (see RATE OF INTEREST). As shown in Fig. 103 (a), the I-S schedule interacts with the L-M schedule to determine a general equilibrium position, Yc, for the economy as a whole. 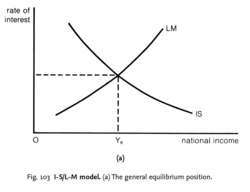 The I-S/L-M model can be used to illustrate how FISCAL POLICY and MONETARY POLICY can be employed to alter the level of national income. If the authorities wish to increase national income, they can, for example, increase the money supply. The increase in the money supply lowers the interest rate. The fall in the rate of interest, in turn, increases the volume of investment (see MARGINAL EFFICIENCY OF CAPITAL/ INVESTMENT) which then, via MULTIPLIER effects, serves to increase the level of national income. In terms of the I-S/L-M model depicted in Fig. 103 (b), the increase in the money supply shifts the L-M schedule from LM to LM2, lowering the interest rates from r1 to r 2 and bringing about an increase in national income from Y1, to Y2 . Alternatively, the authorities could increase national income by, for example, increasing government investment, this increase in investment serving to raise the level of national income via multiplier effects. In terms of the I-S/L-M model depicted in Fig. 103 (c), the increase in investment shifts the I-S schedule from IS1 to IS2, bringing about an increase in national income from Y1 to Y2. See alsoMONEY-SUPPLY/SPENDING LINKAGES.